Chicago Toyota drivers know where to go when it is time to buy a new car. At Midtown Toyota, our team is set on providing top-notch customer service, and we will do what we need to serve you. We have a large selection of new Toyota cars to provide our customers with plenty of quality options to choose from, and our team can help you to narrow down which model really is the best one to fit your needs. One model that we are quite confident will not disappoint you is the 2017 Toyota RAV4. This SUV comes in five main trim levels: LE, XLE, SE, Limited, and Platinum. They are all powered by a 2.5-liter four-cylinder engine that delivers 176 hp and 172 lb-ft of torque. This is paired with either front-wheel drive or all-wheel drive as well as a six-speed automatic transmission. The standard equipment depends on each trim level. The XLE model, for example, gives you comfort features like a dual-zone climate control system, as well as entertainment features like an enhanced Entune multimedia system. The SE is a sport-tuned trim level. It has a different exterior trim, LED headlights, and premium vinyl upholstery. When you get to the higher trim levels, there is even more. The Limited brings on navigation and driver seat memory functions for added convenience. This model also get 18-inch wheels. The Platinum trim level gets you’re the most amount of advanced features for the ultimate comfort and convenience. On every trim level, the Toyota Safety Sense™ P is standard. This system comes with a Pre-Collision System with Pedestrian Detection, Lane Departure Alert with Steering Assist, Automatic High Beams, and a Dynamic Radar Cruise Control. Also standard is the Star Safety System™, which brings in an Enhanced Vehicle Stability Control, Traction Control, an Anti-lock Brake System, Brake Assist, Electronic Brake-force Distribution, and Smart Stop Technology®. In addition to all of these safety features, there are various advanced safety features that are available as a package or on a higher trim level. There is the Blind Spot Monitor, which will alert the driver of a vehicle in their blind spot. There is also a Rear Cross-Traffic Alert System, Hill Start Assist Control, and Trailer-Sway Control. 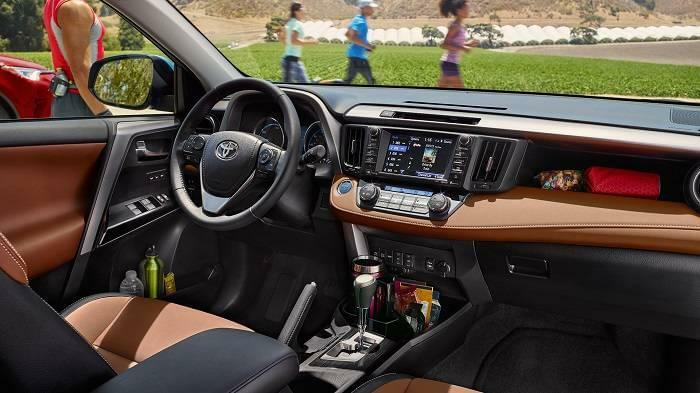 With all these features and more, we know that drivers will feel protected when they drive the new Toyota RAV4 with their family and friends inside. We could go on and on about the Toyota RAV4, but you will not understand how great it is until you see it in person. Head over to our Toyota dealership in Chicago today to take it out for a test drive. While you are here, you can take a look at our other new and pre-owned Toyota cars so that you can find the model to best fit what you are looking for. We are ready to help make your car buying experience a great one that will exceed your service level expectations. We’re located at 2700 N Cicero Avenue and we hope to see you here soon!